– Independent kitchen with a microwave oven and two glass doors giving direct access to the terrace, A toaster and a kettle are provided. 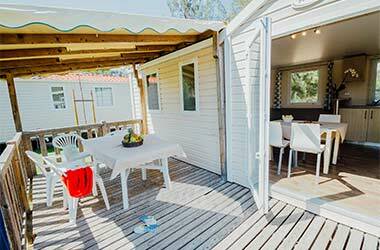 Especially spacious, the Confort Plus mobile home welcomes 5 holidaymakers in the best conditions for an unforgettable stay in Corsica. With the sea accessible on foot, this accommodation guarantees to all a rejuvenating and revitalizing holiday. A large living room extended by a large terrace, a master bedroom and a children’s room with 3 single beds make up the housing. Very bright, the living room of the mobile home has two large windows opening onto the terrace area. 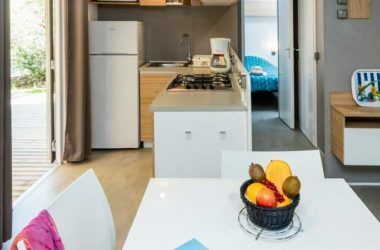 Furnished and tastefully furnished in a contemporary spirit, the living space includes an independent kitchen, and a living / dining room with table, chairs and large bench. 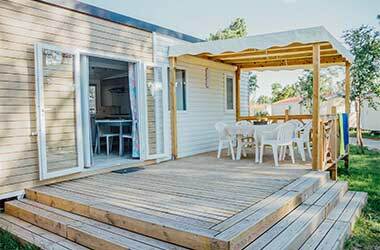 The Confort Plus mobile home has been designed to offer families comfort, space, privacy and practicality. 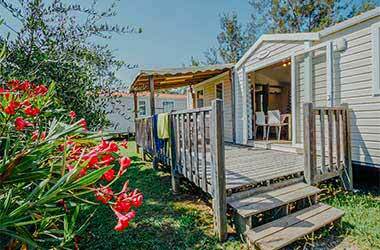 Very functional, the accommodation has a large bathroom separated toilets, and plenty of storage space. The serenity of your nights is provided by air conditioning. 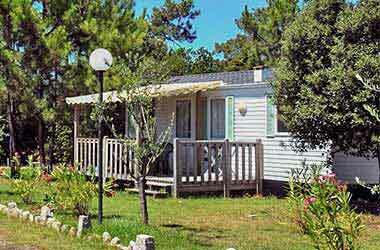 For your beach holiday near Solenzara in Corsica, enjoy in your mobile home Confort Plus a pleasant terrace of 13 m2. Wooden and elevated, it has the charm of holiday homes and pontoons on the sea. An arbor offers a part of covered and shaded terrace, ideal for eating outside or just relaxing outdoors. A garden furniture with table and chairs for 4 to 5 people is at your disposal for your daily meals and your moments of relaxation. For even more conviviality, the living room and the independent kitchen open onto the large terrace thanks to the two large windows of the mobile home. Airy and bathed in light, your accommodation perfectly reconciles comfort and nature. In a unique landscape setting, your stay in the Mobil-home Confort Plus will ensure you a rejuvenating holiday, without constraints and in the open air.